Current research under Dr. Gillette’s sponsorship involves geology and paleontology of the Cretaceous Period in southern Utah (fish, sharks, plesiosaurs, sea turtles, a dinosaur, and a variety of invertebrates), Pliocene and Early Pleistocene faunas of Arizona and New Mexico (especially the extinct relatives of armadillos called glyptodonts), and the Quaternary fauna and flora of the drainages north and west of the Grand Canyon in the Parashant National Monument that promise to elucidate the prehistoric record of climate change in the western Colorado Plateau – northeastern Mojave Desert area of western Arizona. His past research has included dinosaur tracks of the Colorado Plateau, geology and stratigraphy of Mesozoic formations of the Colorado Plateau, and a variety of dinosaurs including Seismosaurus from New Mexico and Barapasaurus from India. 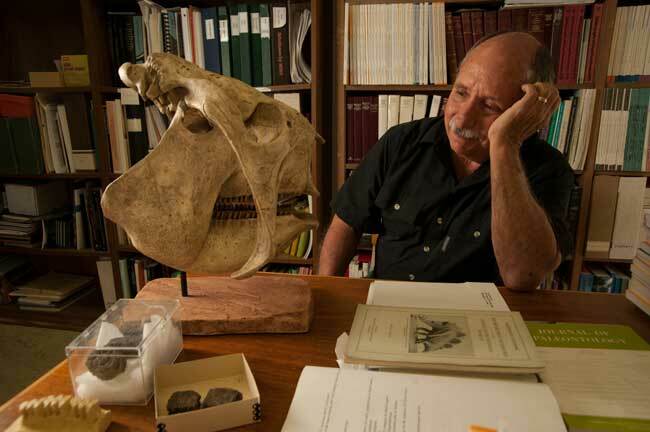 The skull in the photo above is a cast of the South American glyptodont, Glyptodon clavipes.